Raglan Deposits: 35 Mt @ 2.9% Ni. The Thompson Bay deposit alone is over 9 times the size of Nova... 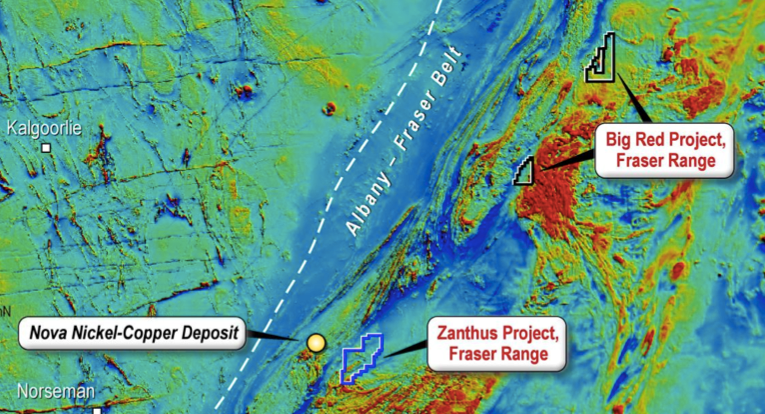 The fact that Fraser Range exploration is in its infancy is a key reason The Next Small Cap has invested in multiple companies in the region. There is strong potential that Nova may just be the beginning of multiple big discoveries... Our latest portfolio addition might be one you haven’t heard of. It’s capped at just $5M and hasn’t received the attention it deserves – until now. 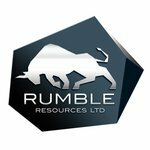 This company is gearing up for a drilling campaign in the Fraser Range in the coming weeks. 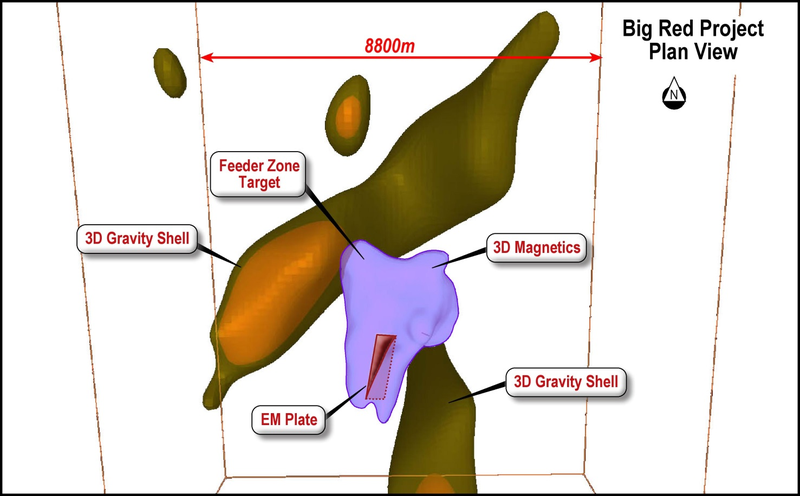 Segue Resources – since the Next Small Cap article on Segue Resources, Sirius went from 5c to $5... New Upstart Explorer Has More Land, More Drilling Targets , SEG has been up as high as 200%. 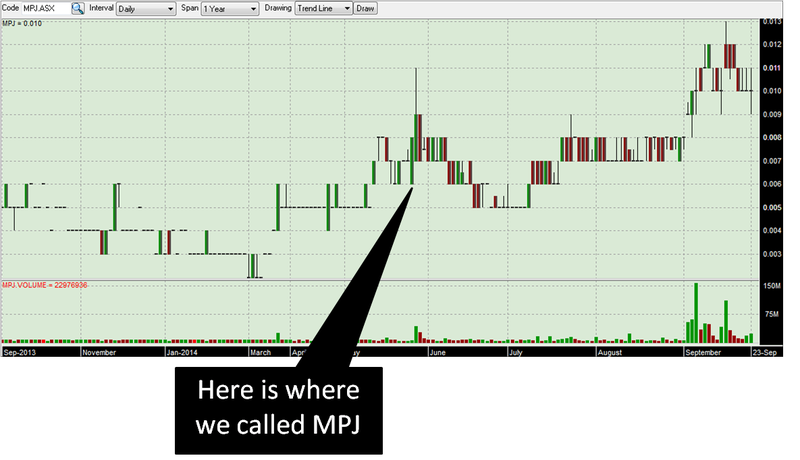 Mining Projects Group – since the Next Small Cap article on Mining Projects Group (ASX:MPJ), Nickel Rock Stars Working For Shares: Twiggy’s # 1 Geologist Plus Sirius Masterminds Combine in One Fraser Range Micro Cap , MPJ has been up as high as 85%. 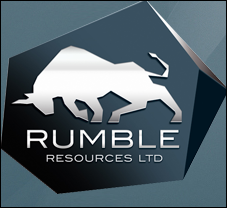 Buxton Resources – since the Next Mining Boom article on Buxton Resources (ASX:BUX), High Grade Graphite Continues to Emerge – BUX’s Final Drill Results Due Any Day Now , BUX has been up as high as 60%. The past performance of these products are not and should not be taken as an indication of future performance. Caution should be exercised in assessing past performance. These products, like all other financial products, are subject to market forces and unpredictable events that may adversely affect future performance. We are hoping tiny RTR can have similar success in the lead up to their own Fraser Range drilling campaign, due to kick off in weeks. We are also keeping an eye on the end prize for all Fraser Range explorers – a discovery on par with Nova... RTR is well placed for success – it still has a tiny $5M market cap, yet is one of the largest tenement holders in the Fraser Range. 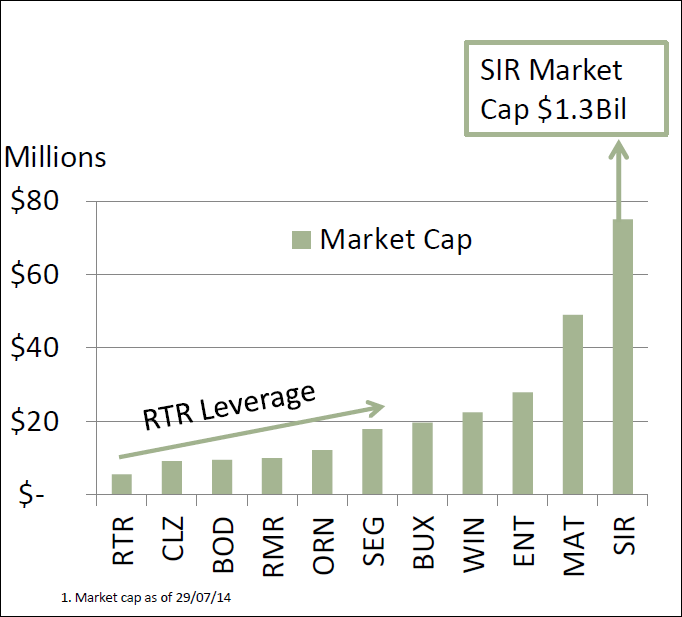 There is a lot of potential at RTR, but as it is still tiny, it remains a high risk speculative investment for us. We think RTR is one of the last ‘under the radar’ Fraser Range explorers, but once drilling starts that may change. Are you an RTR investor and want to spread the word? Nova might be small fry? 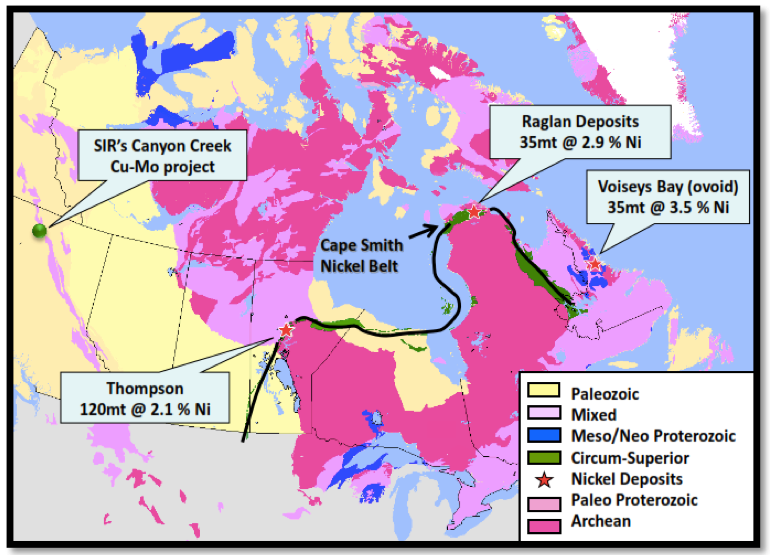 Canada has some of the world’s largest nickel sulphide deposits – just take a look at the figures for Thompsons Bay in the picture above – 120Mt at 2.1% Ni. Voiseys Bay is 35Mt at 3.5% Ni (ovoid), Raglan is 35Mt at 2.9% Ni – and they make Nova-Bollinger look tiny. The development of these nickel sulphide resources from multiple ore bodies in Canada took decades of exploration and modelling. The point is – there isn’t just one. The end game in the Fraser Range could be enormous. It has the potential to be a world-class nickel province and the next discovery could be even bigger than Nova-Bollinger... Enter RTR with its three massive land holdings, huge exploration programme and plans to constantly find targets and drill into them. RTR is now gearing up to drill into this conductor. The Rumble Eye feature indicated in the picture above is a significant find. RTR’s eye feature here is around 2km in length and about 1km wide and has been interpreted as an elliptical magnetic intrusive body. It has the characteristics of a potential nickel sulphide deposit. The aerial survey also identified a number of smaller ‘Nova style eye features’ in the area as well. 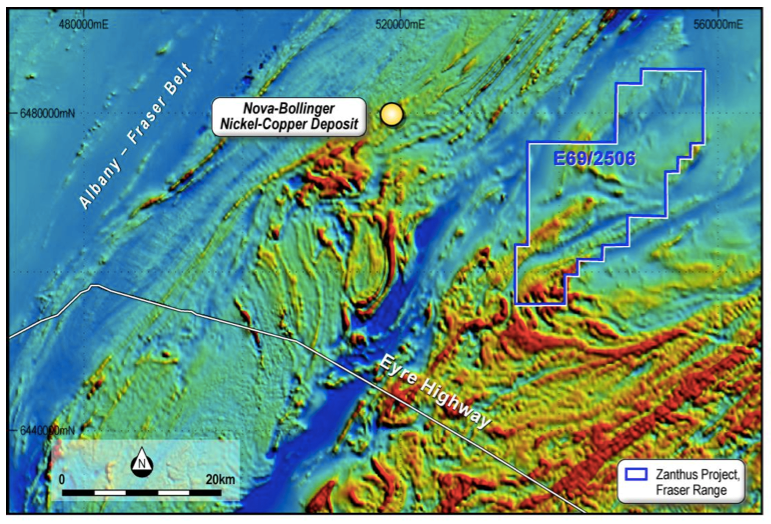 Nova-Bollinger started life as an ‘eye’ feature that Sirius drilled into and confirmed as a massive nickel sulphide deposit. Could this be RTR’s version? Only drilling will tell. 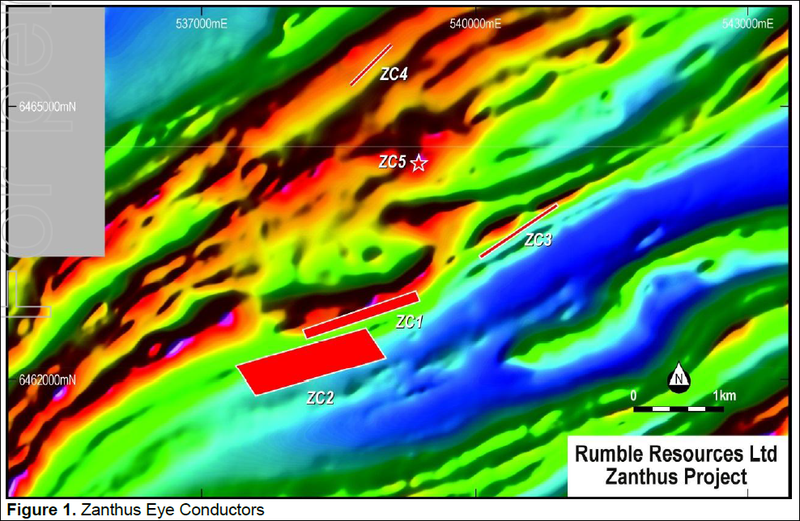 Once all of the EM work has been finished at Zanthus, RTR should have a clutch of targets ready to go and then it will move to the pointy end of exploration – drilling. RTR will design a comprehensive drill program targeting the most compelling bedrock conductors first which start only 100 metre in depth. 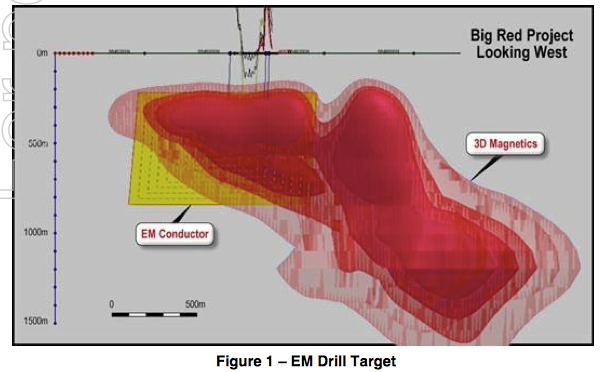 We should have final EM results very soon and then we expect RTR to move quickly into a drilling programme. 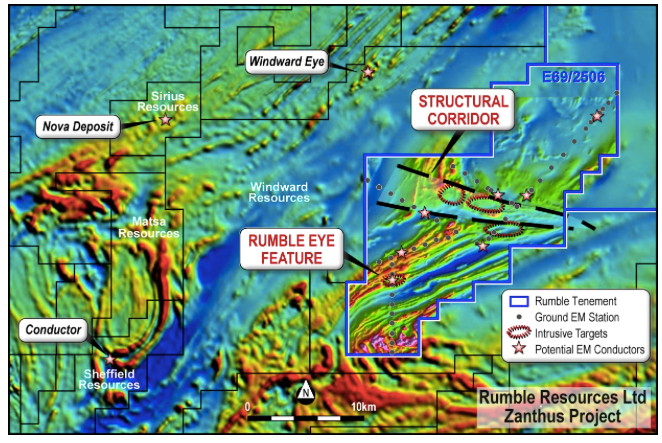 The story of how the massive ‘eye’ feature at Big Red was found by RTR best illustrates the company’s belief that the rocks its tenements have are the right ones for a massive nickel sulphide system. 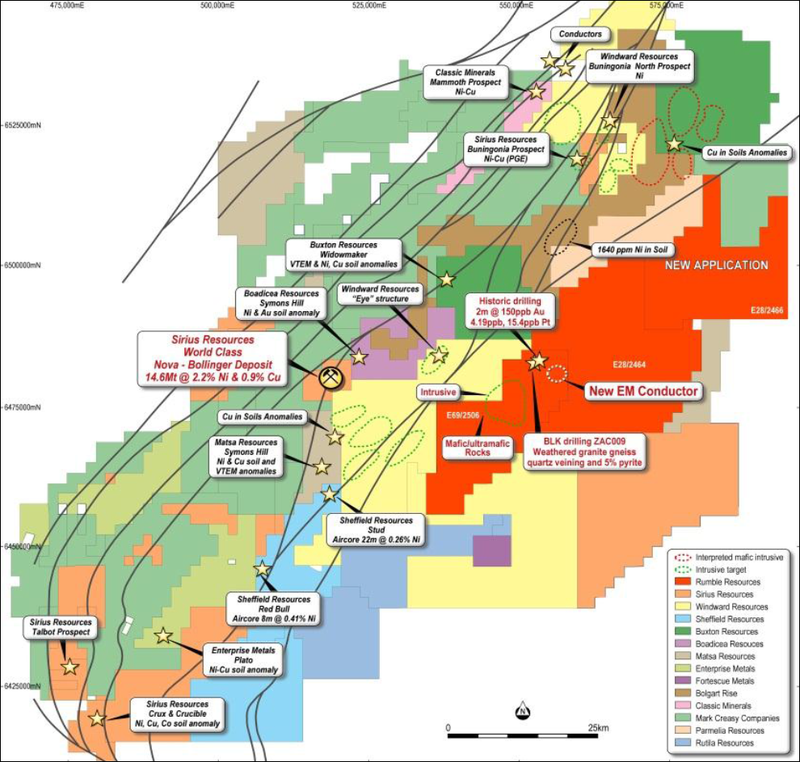 Before RTR came on the scene, a company called Teck Australia Pty Ltd were drilling at Big Red looking for IOCG style copper and gold deposits. It drilled two diamond holes but they failed to find anything like an IOCG. But what the drill holes did confirm was that Big Red has rock formations call Mafic Gabbro Sills – the very rock formations that host the massive Nova-Bollinger deposit. Age dating by the Geological Survey of Western Australia has confirmed the gabbro rocks at Big Red are of a similar age to the ones at Nova-Bollinger. So in essence, RTR’s Big Red Project has the same intrusive rock units as the Nova and Bollinger deposits. More than a billion years ago, the gabbro rocks formed sulphides which then accumulated into massive nickel sulphides. So right off the bat RTR has some excellent signs that geologically Big Red has the right sort of rocks. But gabbro isn’t everything. Magmatic rocks are the key ingredient to look for when you’re hunting a big nickel sulphide deposit. Gabbro rocks are just the icing on the cake. The perception that you need to be in a gravity belt where there is lots of gabbro is wrong. Magmatic rocks are found in abundance at both Zanthus and Big Red and their presence has led to the discovery of Gabbro, not the other way around. As RTR gets ready to drill deeper at its Fraser Range tenements, we will get to know the geology of the region even better and the company will develop comprehensive models of the ground it’s working. 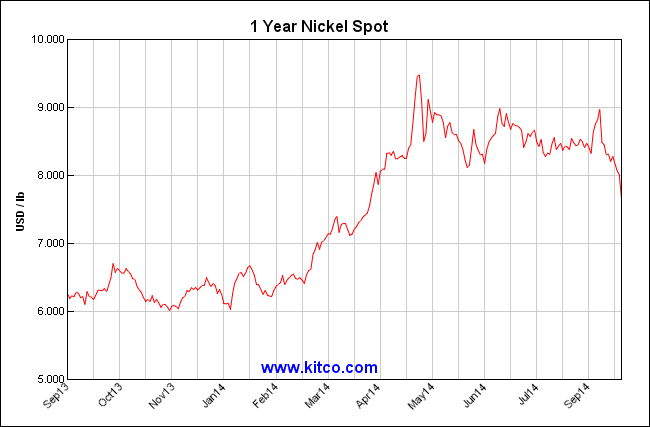 Nickel price set to double? At the start of 2014, Indonesia – then the world’s largest exporter of nickel ore with a 28% share of global supply – did something rather unexpected. It banned, totally and completely, the export of unprocessed iron ore from its borders. 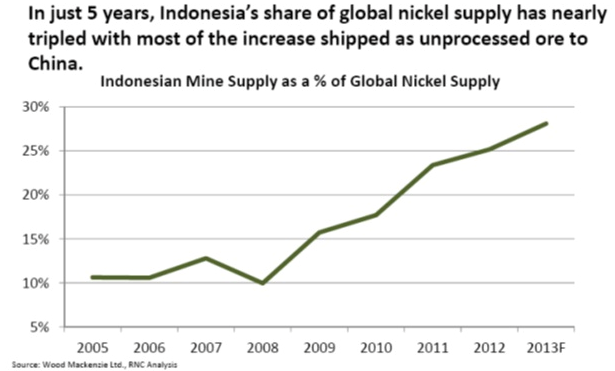 The only nickel that’s now allowed to be exported from Indonesia is processed metal shipments. It sounds mad – until you hear the reason why. Indonesia is now sucking in billions of dollars of investment (mostly Chinese money) to build nickel smelters – exactly what it wants – so that in the future it will be able to make bigger profits from exporting processed material rather than just bulk ore. The ban began in January and at the right hand side of that price graph you can see the nickel price just go through the roof. In a nutshell, before the ban began Indonesia’s nickel exporters churned out as much as they could and after the ban, China’s nickel reserves filled the gap. But those reserves are dwindling and the combination of the ban and shrinking Chinese supply is pushing the price up. 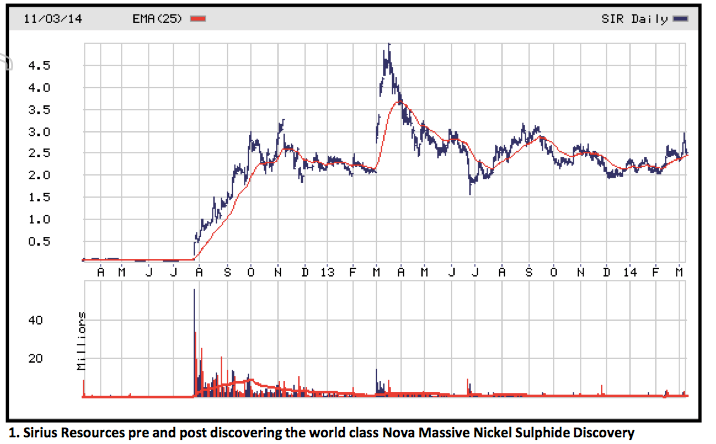 Some analysts are even speculating that the price of nickel could double by 2016... This is all great news for RTR who are looking for nickel right now. 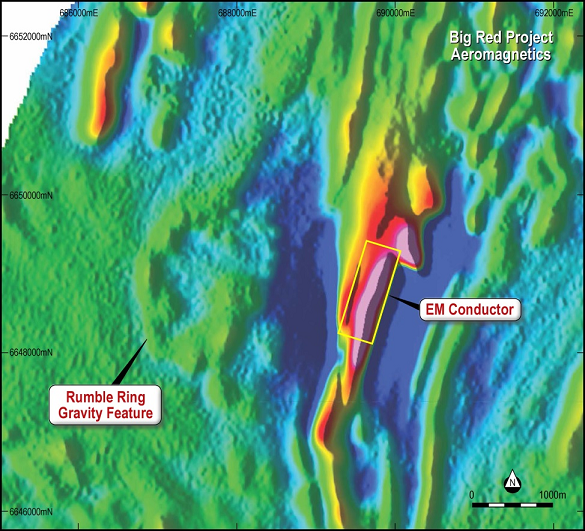 So that’s RTR – two big projects in the nickel rich Fraser Range, with drilling planned in the coming weeks on multiple promising targets. 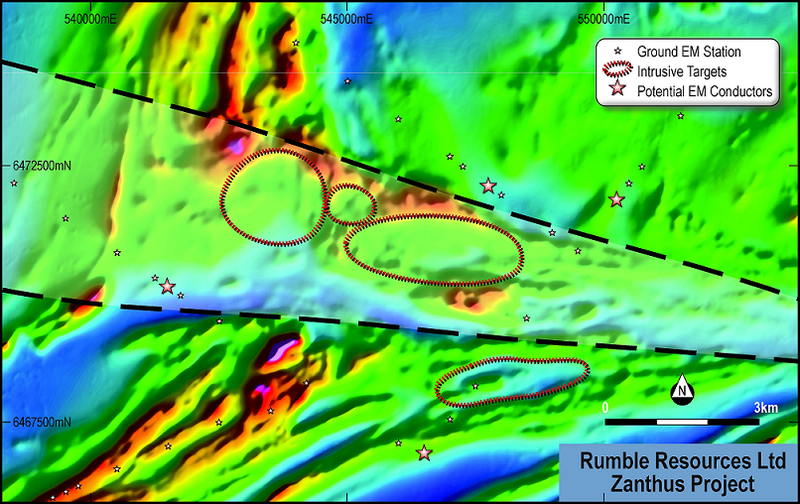 At Zanthus, RTR is engaged in completing a high powered moving loop EM survey to identify further drill targets at the seven areas of potential bedrock conductors, to compliment the 5 bedrock conductors found already at the very large ‘eye’ target. Once that work is complete then we expect to see a target list – and then drilling. 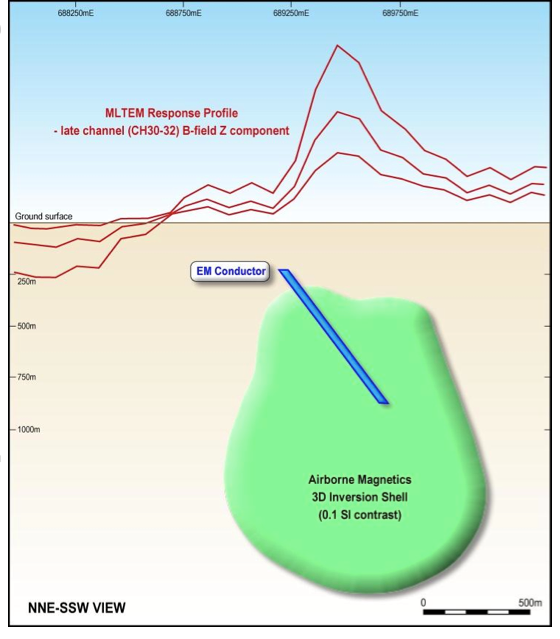 And up at Big Red, the discovery of a large feeder system adjacent to the 2.2km bedrock conductor is yet another sign that RTR is in the right area.